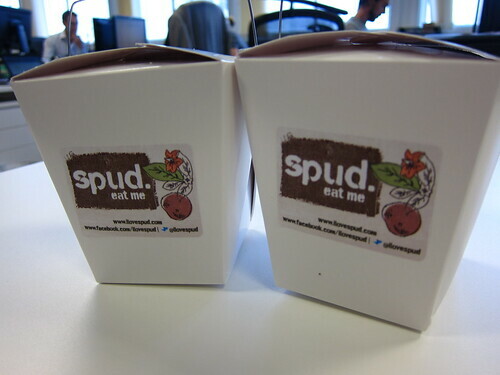 Aah, the humble spud, stalwart of lunches and dinners all over Britain. One even nearly killed me once (true story), an enigma amongst comestibles. The beauty of the humble spud is its abject diversity. Have it plain, add a little butter or salt, and you have a cheap and enjoyable lunch. Add a bit of cheese if you are feeling indulgent, or if you are feeling really luxurious, smother your spud with a chilli con carne or some tuna mayo. Spud on New Row isn't looking to revolutionise your perception of the spud, merely enhance it and give it a little more pizazz. Bringing to the table flavours such as sicilian aubergine and game chilli con carne, it definitely led me to raise an eyebrow. 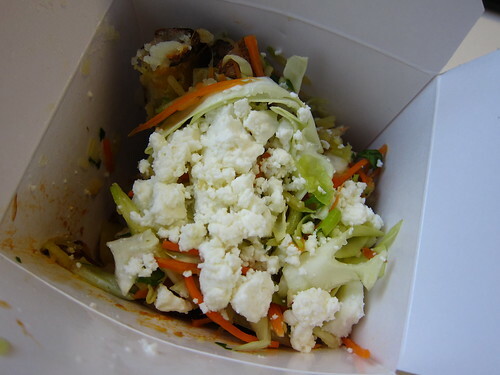 Personally, I was all about the braised BBQ pork, with a cox apple slaw and barrel aged feta. With a choice of three butters (rock salt, ground peppercorn and my choice of herb), I hurried back to my desk, cargo in tow. All in all, a pretty good potato. I liked the sweet pork with the crunchy slaw, and the nuggets of creamy, tangy, and most importantly, salty feta helped balance it all out. The potato was fluffy and didn't feel too heavy at all. On the downside, I felt the pork aspect of the filling was definitely stingy, and for £5.50, it would have been nice to have a bit more protein. Same goes for the butter, I love mine slathered, but I guess it's just a matter of asking. And finally, as attractive as the little box with a handle is, it's pretty awkward to dig out and cut the potato once you are nearing the end. The resounding verdict is a yes to a return visit. On balance, happy with the potato and £5.50 isn't an absurd amount of money to be paying for a filling and enjoyable lunch. The guys in there are super nice too, always a plus, and to be greeted with a smily face after a frustrating morning at work is always well received. Yeah, I think I'll stick with my potato monster from Mortimer's Cafe for a mere £3.50 - including salad. £5.50! @lizzie - Yeah, but this had BBQ pork on it AND coleslaw! @Lizzie - What's in your potato monster? 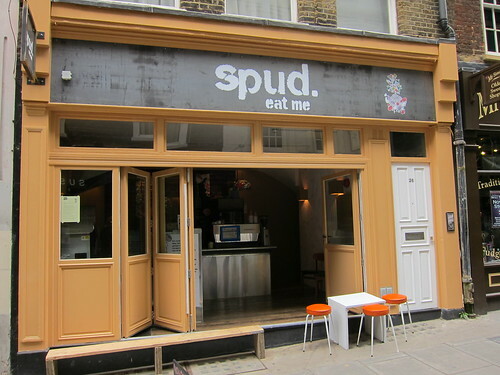 @tehbus - How did a spud nearly kill you??? @ Mimi and Rumbly - For a while when I was ill, I wasn't allowed to eat food with high potassium levels. A baked potato contains extremely high levels of potassium, and when my willpower caved in, I ate one and was subsequently hospitalised. @ Mimi - Stupid EuWen you mean.